I repeat, of all the dysfunctional systems in organizations, the top one on my list is the annual review and next is the JOB DESCRIPTION! Indeed, this is me, Hugh Ballou, the transformational leadership strategist with session #20. This is “Stupid Leadership Traps #4: The Job Description.” It’s a box we put people in; it’s a trap. Converting passion to profits. How do we bring value to everything we do? How does everything we do move toward creating liquidity, income, profit for the enterprise that we lead? It’s very purposeful thinking. Orchestrating success is how we leaders impact the organizations that we have been charged with leading. We are either charged by ourselves, our vision, our calling, or we are charged by someone else who has hired or engaged us to move this organization to the place that it should be. In order to do that, we must have a high-functioning culture. We lead people, we empower people, we enable people. We create value for others. We create results. It’s important that we have a high-functioning team. If we are going to orchestrate success, we need to have people around us. In an orchestra, we have highly skilled musicians who understand how to play their instrument. We give them a piece of music to play. We empower them to rise above the level of mediocrity and create value by performing at the highest standard possible. You don’t have a job description in an orchestra. You have a position. I am first oboe. I am principal cellist. We lead the section. Our role and responsibility is to play the notes, to lead the section, to help create ensemble. If you are the leader in the strings section and the conductor wants a certain kind of sound, then you will speak to the concert master/mistress and say, “This is the sound that I want.” They will interpret it into violin talk, cello talk, bass talk, and viola talk. They will interpret and empower the group to provide the specified results. If we try to detail every single action that these people do, it would be a huge list of what to do and what not to do. Instead, we say, “You have responsibility for this. This is your role. Concert mistress/master, this is your role.” There are several jobs that you have, and there are several responsibilities that you have. We have specific roles that we play in these organizations, and the conductor empowers people. We create this culture of high performance. Time after time, I work with organizations, and they talk about the job description. What I hear from people in the workplace is, “That is not my job. I don’t do that.” What we have done is created silos. We have divided people by their job description. What the intent is is to have a document that describes the scope of what they do. Most of these job descriptions, when I look at them, they don’t do that. They are simply a list of tasks. We are putting people in a box. This is what you do: 1, 2, 3, 4. If it’s not on the list, why should they want to do that? Almost as soon as you write it, it’s outdated. We have to go back and modify it because we thought of things that are not listed. We get this big cumbersome document that is a list of stuff to do, and it’s the minutiae. 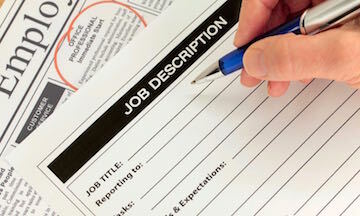 The idea for why we want to create a valuable job description is that it protects everyone. Yes, we do have laws, we have human resource departments, and there are things we have to do to make sure that we are in compliance. If it’s not written correctly, then the dissatisfied employee can turn it around and sue the company if there is an inadequate description. The intent is also to provide expectations. I don’t see job descriptions that define outcomes or expectations. It’s not there; it’s not best practice. It’s supposed to clarify that this is what you do—is this a fit for you? There are many missing parts. We don’t define the competencies. There is a lot we don’t define in the culture. We don’t define specific, measurable outcomes. In my world, the job description is one of the most dysfunctional tools that we have in any kind of organization. We write it, we put it in a book, and we never look at it. I have met people in organizations that have no clue what their job description says. They signed it, and it has been put away in the HR department. Once a year, someone drags it out and compares it with what they really do. You modify it and put it away for another year. I don’t think that’s best practice. I don’t think that’s effective. It’s a waste of time. Here is a list of the competencies. Do they have an education? Do they have experience? Have they been successful? We have defined the competencies for this position. Secondly, we have defined their roles and responsibilities. You are in charge of marketing. You are the director of marketing. Your role is to create and implement marketing strategies that increases our revenue by 25%. Your responsibility is to oversee and maintain those programs. We are very clear on what you do. Whatever it takes, you will reach those outcomes. We are not going to define everything you do. We are going to define the results. We are also going to define the core values for the organization and the guiding principles. These are the principles we use in the guidelines for making decisions. This is how you function. Yes, we fit values. Yes, we understand the principles. We define the outcomes. The other piece that is the companion piece to the position description is an ongoing list of performance expectations that you update every week. Here is what we want for the year. We said that. We come backwards. What will happen in 30 days? What will happen in 60 days? What will happen in one week? We begin to define performance expectations. We share it with the rest of the team. Every week, we have a flash meeting with the team. Everybody reports on their outcomes. This is what I have accomplished, or this is where I need help. Then we define what will happen the following week. In that conversation, we develop the synergy of working together. In the flash meetings, we learn collaboration. We erase the silos. We create this higher performing level that we call ensemble in music. In the workplace, I have created the brand SynerVision. It is the synergy of the common vision. W have the overarching vision that is defined by the leader. We have measurable outcomes, and it is targeted for specific parts in the strategy as implemented by specific people in the organization. Here you have it. Stupid leadership traps #4 is the job description. This is what we have been taught, this is what we have learned, and this is what we have inherited. It is a totally useless system. It’s time to revise it. It’s time to do something different. This is Hugh Ballou, the transformational leadership strategist encouraging you to think creatively. What impact do you want to have on the organization you lead and people that you serve? The tip for this session is to define the outcome. Make your own set of performance expectations. Share them with your team. You model excellence, and the team follows. Change yourself, and others will respond. Thank you. Hope this is helpful. We are starting a series of smart things leaders do next.